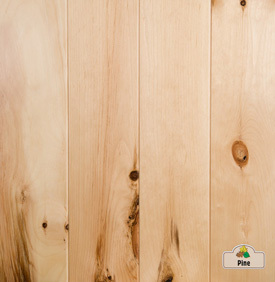 Eastern White Pine | aka: White Pine, northern white pine, northern pine, Weymouth pine, Quebec yellow, cork pine, and pumpkin pine. Growth: Canada, Mexico, and United States. Appearance: Straight grained with a fine, uniform texture. Creamy white, pale yellow or light brown heartwood and creamy white sapwood. Yellows with age. Physical Props: Soft, weak, and light with low decay resistance, shock resistance, and steam bending. plywood. Uses: Uses include turnery - spools, bobbins, dowels and novelties, crates, toys, cooperage, baskets, ice cream spoons, medical spatulas, veneer, paneling, and pulp for writing paper. Comments Resembles maple and is often used interchangeably with it.